Traveling to a new country is almost always an exhilarating and incredible experience. You can have an idea of what to expect from a bit of reading beforehand, but there are some things that you get only from spending time in the country. The wonderful and weird intricacies of a culture are truly only experienced firsthand! 1) There are over 3000 varieties of potatoes in Peru! They come in varying shapes, sizes, colors, and are included in every meal. Breakfast might be eggs and potatoes, lunch might be a quinoa and potato stew, dinner might be meat and potatoes…but potatoes you will definitely have! You have them to thank for all your potato dreams, it was discovered that potatoes originated in Peru over 7000 years ago! 2) Dogs make a backdrop for streets all over Peru. They are, however, not considered a nuisance, but part of the city. In fact, they are not even stray at all. Someone told us that they keep to a certain locality and are cared for, resulting in their sitting or sleeping dutifully in the doorways of the families that care for them. A local restaurant owner even mentioned that unlike dogs in the US, which are given a life under the control of the family that owns them, Peruvian dogs are independent and have a life and mind of their own. 3) Quinoa, kiwicha(amaranth), chia – these buzzwords of the health food industry currently are all indigenous to Peru and have been a part of Peruvian staple diets for centuries. They are also present in every market, restaurant, and even sold in piles along the streets. One of my favorite foods in Peru was a quinoa and apple porridge made for breakfast that was sold early mornings on bikes and stalls on the streets. Do try it if you are in Peru! 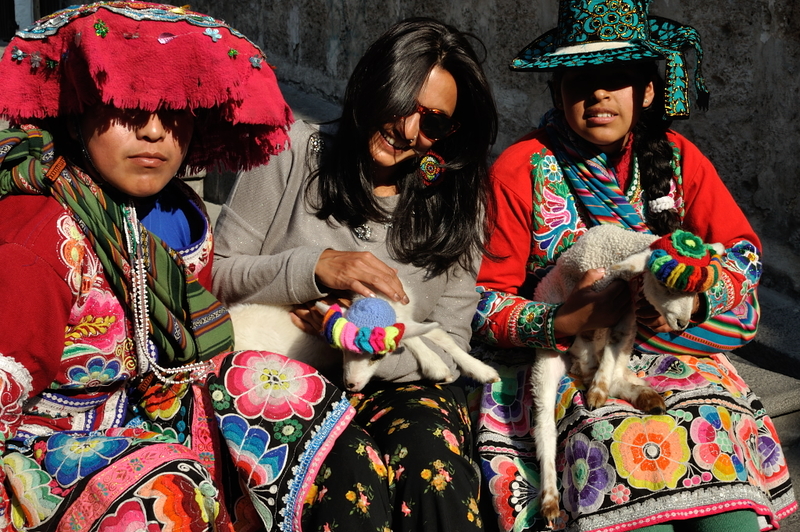 4) Peruvian clothes and handicrafts are by far some of the most colorful I have seen. I was obsessed with the markets, and that’s coming from someone who barely does any shopping otherwise. Colorful scarves, ponchos, boots, rugs, bags, and everything in the markets had me good. One of my favorites was the Pisaq market in the Sacred Valley – learn a bit of Spanish and bargain! 5) The Rainbow flag that you will see all around Cuzco is actually the official flag of Cuzco, the sacred capital of the Inca Empire, and is NOT to be confused with the gay pride symbol. The “wiphala” flag has its origin in Inca culture and can be seen in Peru and Ecuador to represent Inca territory. The existence and use of this emblem has apparently been around for almost 2000 years. The Incas considered the rainbow a gift from god, and the famous Coricancha temple in Cuzco even has a room honoring the god of the rainbows. 6) Peru is a dramatic mix of old and new. After the conquest of the Incas by the Spanish, the combination of the strong Spanish influence with the rich heritage of Inca culture has shaped the country’s traditions, religion, and culture. Although the majority of Peruvians are now Catholic, the Peruvian Catholicism has traditional beliefs incorporated into the practice. Churches are present in every town, however small, but the people also recognize Pachamama (Earth) and Inti (the sun-god) in their worship. It’s really a fascinating intertwining of native and modern beliefs. 7) Peruvian gastronomy has made waves internationally, so I knew we would be eating well. What really surprised me is the breadth of flavors, ingredients, and techniques that were seen in different regions of the country. Lima definitely has the more cutting edge restaurants and chefs, whereas Cuzco and Arequipa have more traditional offerings. 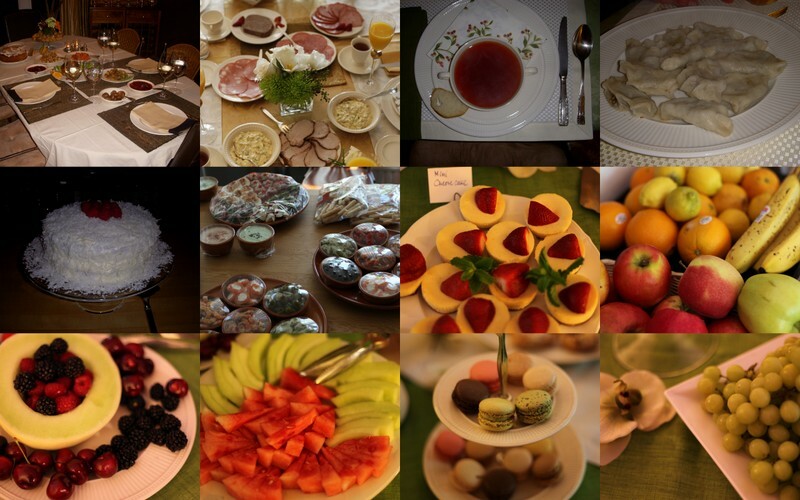 The food is very different region to region, based on the climate, the altitude, and the availability of ingredients. If you are an adventurous eater (I am! ), try the alpaca steak, or, the cuy, which is guinea pig. Yes, guinea pig. As I mentioned earlier, potatoes, corn, and quinoa are also major players in the food world. Fruits and vegetables are beyond amazing – many fruits come from the Amazon, and the variety and flavors are mind boggling, from passionfruit to custard apple (cherimoya) to avocados, fruits here are like nothing you’ve had before! Lots of fresh juices are available in the markets, which was one of the highlights. I particularly loved San Pedro market in Cuzco. 8) Peruvians of Inca descent have jet black hair well into their 80’s, and this is all natural! I wish I had those genes! Also, the blonde and more Caucasian looking Peruvians are typically of Spanish descent. 9) Peru is full of breathtaking photo opportunities, from the striking Andean mountains, the Amazon rainforest, snow capped peaks, historical cities, colorful people, rugged coastline, expansive Lake Titicaca, llamas and alpacas in the countryside, and so much more. The best way to enjoy it is to take it all in and put the camera away, however hard that is. 10) The Chakana symbol is seen all over Peru. This Incan cross represents 3 worlds – the upper world of gods, the middle world of our existence, and the underworld occupied by the dead. It represents the circle of life, and you will see this symbol everywhere – buildings, clothes, jewelry, and hanging around necks of the local people. 11) The people of Peru are one of the happiest and friendliest I have come across in my travels. We saw this everywhere – from our hotel managers, restaurants owners and workers, tour guides, people on the street we asked for help from, the store owners who you bargain with, quite literally everyone, we always felt like they were genuinely happy and content with whatever they had. In our two weeks in Peru, this was the one thing that stood out consistently everywhere we went, and we came away realizing that we have a lot to learn from them. What have you discovered on your travels? Please share in the comments! Aparna is a DC-based blogger focusing on travel and exploring food in the places she visits, but also enjoying discovering new spots in DC. Follow her adventures via http://www.hungrytravelist.com.